CLEARWATER, Fla. — It may soon be illegal to make a left turn at the Gulf to Bay Blvd. and Belcher Road intersection. 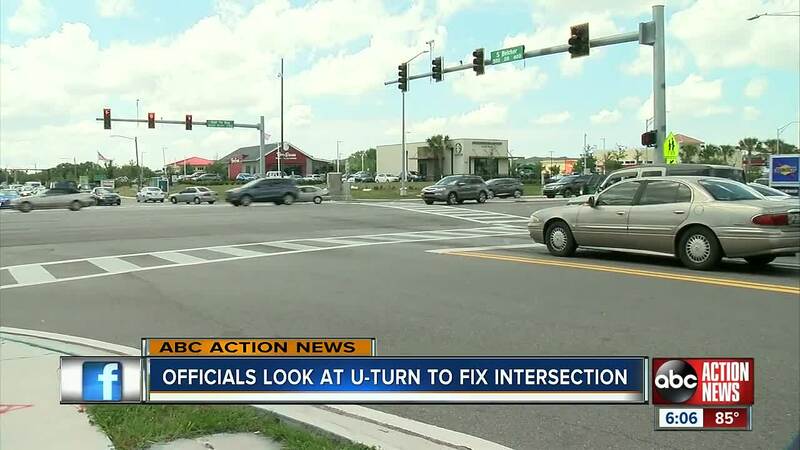 Pinellas County officials are looking into eliminating left turns to make the dangerous intersection safer for drivers and pedestrians. "Something needs to be done," said Nick Hertine. Nick works at Digital Ninjas, a computer store on Belcher. He said he's seen a lot of accidents at the intersection. "It's one of the most dangerous intersections in the area," said Hertine. "I've seen people get run over, cars flipped, and people on bikes have been hit by cars." ABC Action News has covered dozens of accidents at the intersection, including one from last October. A driver who was trying to make a left turn hit a motorcyclist. "it's been a mess," said Hertine. Florida Department of Transportation made some immediate changes after that crash, and added new red light cameras. Drivers say they've noticed a difference, but they say more needs to be done. However, most don't like the idea of eliminating left turns. If the county does get rid of left turns, drivers wanting to turn left onto Belcher from Gulf to Bay will have to go through the intersection, up to the next traffic light and make a U-turn. They will then have to get in the right lane to turn right. Drivers will have to do the same thing to make a left turn from Belcher onto Gulf to Bay. "We'll have more people making U-turns, which is a lot more dangerous in my opinion," said Hertine. He believes the best solution is adding more lanes to Belcher. Official say they are looking at all options. They're going to go with the safest options that's also cost effective.